Simple solutions to the Problems of Physics Caused by the 'Particle' Conception of Matter. From Matter as 'Particles' moving in Space and Time, to Matter as Spherical Wave Motions of Space. This page has a short summary of Physics with a simple explanation of their problems founded on the Wave Structure of Matter in Space. This is followed by a good collection of important / famous physics quotes. The articles listed on each side of the page explain how the Wave Structure of Matter (WSM) simplifies and solves numerous problems of physics, philosophy and metaphysics by explaining how matter is necessarily interconnected to other matter in Space across the observable Universe. Abrupt Abstract! : The solution was simple - just replace the current paradigm of matter / energy in space-time, with the most simple foundation - the wave motion of space. We find that matter is a spherical in out wave structure in space, the wave-center forms the particle effect, the spherical in and out waves provide continual two way communication between all matter in the universe (matter shares its wave energy / vibrates with other matter in the space around it). As a wave is an oscillation between kinetic and elastic energy of space (a wave medium) thus matter-energy in space-time is really just spherically vibrating space. Time / change is due to the wave motion of space (which causes matter's dynamic activity that we perceive as change / time). The 'particle' effect of matter is obviously formed at the wave-center of the spherical standing waves. The 'particle / photon' effect of light is due to resonance and discrete standing wave interactions - this is why Schrodinger's wave equations are used to determine these discrete energy states. The wave diagrams page makes this much easier to visualise. Thus 'particle / field interactions in space-time' are really just wave interactions in space. The spherical in-waves change velocity when they interact with other matter waves while flowing in to the wave-center, causing the wave center to re-position (the particle to move around / accelerate). 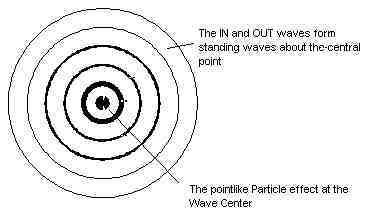 This makes it easy to understand how the wave-center 'particle' is connected to and interacts with all the other matter in the universe. Einstein, Schrodinger and Bohm were correct - matter is a spatially extended structure of the universe. Philosophy, physics and metaphysics are not abstract concepts (academics may make them abstract and meaningless). They are the study of what we really are as humans existing in the Universe. This is why true knowledge of reality is profound - as it is about our true existence in Space. We can now deduce that we humans are spatially extended wave structures of the Universe. Physics tells us that all matter interactions in space-time, are really just wave interactions in space. Matter is very large - as big as the universe! But we only ever experience the high wave amplitude wave-centers and have been deceived into thinking matter was a tiny 'particle'. Go and gaze at the night sky, all those brilliant bright stars surrounded by Space (if you are in the darkness of the country). That is you. This is why you can see stars, because those stars are a part of you, as you are a part of them. Einstein knew this. What follows is a short summary / solution to the central problems of physics, based on this most simple conception of the wave structure of matter in space. The main problem for physics has been the introduction of the concepts of 'particles', 'fields' and 'time' in addition to Space. But no one has been able to unite these different concepts (Einstein rejected the discrete particle concept and tried to represent matter/energy as continuous fields in space-time, but he could never explain the discrete aspects of light and matter found in Quantum Theory). However it is well accepted by scientists (and philosophers / metaphysicists ) that physical reality is interconnected (there is no separation between matter, energy, space and time, they are all one interconnected thing). The solution is very simple and obvious once known. All we needed to do was abide by these rules of Science (Occam's Razor / simplicity), and in particular, Physics, Philosophy and Metaphysics. i.e. To realise that there is an underlying unity / interconnection to reality, thus if you start with Space, then you cannot add anything else too it (e.g. particles, fields, time) and instead you must simply consider the Properties of Space. We can now explain this Substance and its Properties by describing Reality in terms of One thing, Space (a physical substance), existing with the Properties of a Wave Medium - which abides by the rules of Metaphysics, where matter's activity (change / time) comes from the wave motion of Space. Matter is formed from spherical standing waves in Space. A Brief History of Physics (Reality) and a Simple Solution to their Problems. Physics classically evolved from Newton's Mechanics (1687), which was founded on 'mass' particles and instantly acting gravitational forces in Absolute Space and Time, i.e. F=m.a. Newton acknowledged that he did not know how these discrete and separate particles could instantly act on one another across Space - it was just mathematical formalism. Then in the early 19th century Faraday added the concept of charged discrete particles generating continuous electric and magnetic fields which acted on other charged particles in Space around them. When Maxwell showed (Maxwell's Equations) that a wavelike interaction between the electric and magnetic fields (the Electromagnetic Wave) propagated with the measured velocity of light it seemed to confirm this electromagnetic (em) structure of Light and Matter, and that matter interactions where not instant-actions-at-a-distance (Newton), but limited by the velocity of light c (Einstein's Locality). This was then further formalised with Lorentz's em Theory of the Electron (1900). However, at the turn of the 20th century, Plank's discovery of the discrete 'quantum' properties of light, followed by Einstein's work on the photoelectric effect (1905) shattered this continuous wave nature of light (light seemed to also behave as a discrete 'particle / photon'). With de Broglie's further conception of the wave properties of matter this meant that by the 1930s there was a particle wave duality for both light and matter (depending on the experiment)! This became even more confusing with Born's discovery that the square of Schrodinger's Wave Equations (using standing waves / resonance to explain discrete energy states of light and matter) could be used to find the probability of where the 'particle' would be found. Add to this Heisenberg's Uncertainty Principle, and Bohr's Copenhagen Interpretation (Nature is statistical rather than deterministic, particle and wave complement one another) then you can see how confusing Physics had become. 'The first philosophy (Metaphysics) is universal and is exclusively concerned with primary substance. ... And here we will have the science to study that which is just as that which is, both in its essence and in the properties which, just as a thing that is, it has. Despite this pessimism, a few people have (over the past 20 years) shown that there is in fact a very simple sensible solution to these problems that (strangely) has been largely ignored over the past 70 years. To consider a pure Wave Structure of Matter in Space. This Metaphysics of Space and the Wave Structure of Matter (WSM) solves these problems by describing Reality in terms of One thing, Space, existing with the Properties of a Wave Medium (which abides by the rules of Metaphysics, where matter's activity comes from the wave motion of Space). We can then explain these central concepts of physics, i.e. 'particles, fields and time' in the following manner. Time is due to the Wave Motion (activity) of Space. Forces / Fields are caused by the interaction of the Spherical In and Out Waves with other matter in Space which changes the location of the Wave-Center (and which we 'see' as a 'force accelerating a particle'). Particle Wave Duality of Matter - This is obviously explained by the Wave-Center of the Spherical Standing Wave. Particle Wave Duality of Light - This is a little more complex, but still simple once understood. The discrete 'particle / photon' effects of light occur because standing wave interactions (like electrons in certain wave functions in an atom) only exist at discrete frequencies, which equate to discrete energy states where E = hf. And this is why de Broglie & Schrodinger introduced wave equations into Quantum Theory in the first place, to explain these discrete aspects of reality / matter and its interactions). Most importantly, the Wave Structure of Matter (WSM) simplifies Einstein's foundation from continuous spherical fields in space-time, to spherical waves in continuous Space. In fact the WSM, being founded on the existence of one thing, Space (and its properties as a wave medium), is the most simple science language for describing physical reality. Thus it has been negligent of Scientists in having not given the Wave Structure of Matter proper consideration when the wave properties of light and matter were first discovered. Finally, does it work, i.e. does the Wave Structure of Matter unite the central theories of modern physics? The Wave Structure of Matter deduces fundamentals of Einstein's Relativity (relativistic mass increase) and Quantum Theory (de Broglie wavelength) due to Doppler effects of relative motion (in the one set of simple wave equations). See articles by Prof. Milo Wolff. It also solves numerous problems in Cosmology by realising that the redshift with distance is due to decreasing wave interactions with distance. i.e. It is not a Doppler effect, thus there is no expansion from a Big Bang / creation. Space has always existed to infinity (which is logical given it is the one thing that exists, thus it cannot be created or bound by something else). As Prof. Carver Mead wrote; (Professor emeritus at the California Institute of Technology (Caltech), having taught there for over 40 years. Received the Lemelson-MIT Prize ($500,000) in 1999). For more information on what is really a very simple and sensible description of physical reality please see the links on the side of this page. Below you will find an interesting collection of famous physics quotes. .. it is impossible that the primary existent, being eternal, should be destroyed. .. that among entities there must be some cause which moves and combines things. The development during the present century is characterized by two theoretical systems essentially independent of each other: the theory of relativity and the quantum theory. The two systems do not directly contradict each other; but they seem little adapted to fusion into one unified theory. For the time being we have to admit that we do not possess any general theoretical basis for physics which can be regarded as its logical foundation. This last statement is very important. It is the same position that Einstein supported. The Wave Structure of Matter confirms this view. Reality is necessarily connected (by Space and Spherical In & Out Waves that form matter) but we lack knowledge of all its interconnections, which gives rise to the statistical / probability aspects of reality as determined by Quantum Theory. For the time being we have to admit that we do not possess any general theoretical basis for physics which can be regarded as its logical foundation. The field theory, so far, has failed in the molecular sphere. It is agreed on all hands that the only principle which could serve as a basis of quantum theory would be one that constituted a translation of the field theory into the scheme of quantum statistics. Whether this will actually come about in a satisfactory manner, nobody can venture to say. As I have written before - it now seems obvious to me that Einstein's solution is found by rejecting particles AND continuous spherical forces AND Time - to describe reality from one thing, Space and the spherical wave motions that form matter. This solves so many of their problems that I will always find it strange that they never considered it! I also emphasise that there is a big difference between a necessarily connected universe (WSM), and a deterministic universe. To me, one Space must be Infinite, thus the system as a whole can never be determined (but it is necessarily connected). I see this as the reason for our limited free will. At the same time that the wave properties of matter were discovered, two further discoveries were made that also profoundly influenced (and confused) the future evolution of modern physics. Further, because both the observed position and momentum of the particle can never be exactly known, theorists were left trying to determine the probability of where, for example, the 'particle' would be observed. Born (1928) was the first to discover (by chance and with no theoretical foundation) that the square of the quantum wave equations (which is actually the mass-energy density of space) could be used to predict the probability of where the particle would be found. Since it was impossible for both the waves and the particles to be real entities, it became customary to regard the waves as unreal probability waves and to maintain the belief in the 'real' particle. Unfortunately (profoundly) this maintained the belief in the particle/wave duality, in a new form where the 'quantum' scalar standing waves had become 'probability waves' for the 'real' particle. Albert Einstein is correct in one sense, mistaken in another. It is true that matter is intimately interconnected to all the other matter in the universe by the Spherical In and Out-Waves, something quantum theory discovered but never correctly understood. This has become known as quantum entanglement and relates to the famous experiment posed by Albert Einstein, Podolsky, and Rosen (EPR) (see Section 1.7 for an explanation of this experiment) and when later technology allowed its experimental testing, it confirmed quantum theory's entanglement. Albert Einstein assumed this interconnectedness was due to the spherical spatially extended field structure of matter, instead, it is due to the interaction of the spherical spatially extended Standing Waves of matter with other matter's Wave-Centers distant in Space. Explaining this Standing Wave interaction of matter with other matter in the Space around it (action-at-a-distance) is largely the purpose of this Article and is one of the great powers of the Metaphysics of Space and Motion and the Spherical Wave Structure of Matter. Nonetheless, Albert Einstein was very close to the truth. He realised that because matter is spherically spatially extended we must give up the idea of complete localization and knowledge of the 'particle' in a theoretical model. For the particle is nothing but the Wave-Center of a Spherical Standing Wave, and thus can never be isolated as an entity in itself, but is dependent on its interactions with all the other Matter in the Universe. And it is this lack of knowledge of the system as a whole that is the ultimate cause of the uncertainty and resultant probability inherent in Quantum Theory. Albert Einstein believed that Reality could be represented by spherical force fields, that reality was not founded on chance (as Bohr and Heisenberg argued) but on necessary connections between things (thus his comment 'God does not play dice'!). He was largely correct, Matter is necessarily connected due to the Spherical Standing Wave Structure of Matter, but due to lack of knowledge of the system as a whole (the Universe), and the fact that it is impossible to determine an Infinite system (of which our finite spherical universe is a part - see Article on Cosmology), then this gives rise to the chance and uncertainty found in Quantum Theory. Paul Dirac was a very smart sensible Physicist. This statistical interpretation is now universally accepted as the best possible interpretation for quantum mechanics, even though many people are unhappy with it. People had got used to the determinism of the last century, where the present determines the future completely, and they now have to get used to a different situation in which the present only gives one information of a statistical nature about the future. A good many people find this unpleasant; Einstein has always objected to it. The way he expressed it was: 'The good God does not play with dice'. Schroedinger also did not like the statistical interpretation and tried for many years to find an interpretation involving determinism for his waves. But it was not successful as a general method. I must say that I also do not like indeterminism. I have to accept it because it is certainly the best that we can do with our present knowledge. One can always hope that there will be future developments which will lead to a drastically different theory from the present quantum mechanics and for which there may be a partial return of determinism. However, so long as one keeps to the present formalism, one has to have this indeterminism. Quantum Theory: Particle Wave Duality - The particle-wave duality of Matter is obviously explained by the WSM. Spherical Standing Waves (Scalar Quantum Waves not Electromagnetic Vector Waves) cause the Particle effect at their Wave-Center. Quantum Theory: Light Quanta (Photons) - Likewise the particle-wave duality of Light is also explained by the WSM. Light is a wave phenomena, but Standing Wave Interactions (Resonant Coupling) only occur at discrete frequencies which explains Schrodinger's wave equations and the discrete energy exchanges of Light Quanta (Photons). These quotes from Schrodinger can be clearly understood by the Wave Structure of Matter, which confirms that there are no separate and discrete particles, no subject and object that are not also part of one interconnected thing (Space and its Wave Motions). Because Schrodinger believed in real waves, he was never happy with Max Born's statistical / probability interpretation of the waves that became commonly accepted (and was actively promoted by Heisenberg and Bohr). One does not, by knowing all the physical laws as we know them today, immediately obtain an understanding of anything much. Fritjof Capra got a lot right in his Tao of Physics due to his knowledge of Eastern Philosophy and Western Physics, thus his realisation of the Dynamic Unity of the Universe is important. Quantum Theory is founded on Wave Equations. Thus it is a strange thing, that for thousands of years we have imagined matter as discrete and separate particles and yet when the wave properties of matter where discovered they never thought to try a pure Spherical Standing Wave Structure of Matter. (i.e. Real waves in a Real Space). Instead Quantum Theory evolved along the path of the particle / wave duality of light and matter, and Born's statistical interpretations of the waves (which in hindsight was obviously going to lead to the end of a meaningful physics). As the many articles below explain, the Spherical Standing Wave Structure of Matter in Space does solve many of the problems of Physics very simply and sensibly by providing the Metaphysical foundations for the fundamental laws of Nature (which found our knowledge of the real world). Quantum Physics: Quantum Theory / Wave Mechanics - Historical Analysis and Solutions to Problems of Quantum Theory (Quantum Mechanics). On Planck, Einstein, Bohr, de Broglie, Schrodinger, Heisenberg, Born, Feynman, Wolff. I am standing on the threshold about to enter a room. It is a complicated business. ... I must make sure of landing on a plank travelling at twenty miles a second round the sun - a fraction of a second too early or too late, the plank would be miles away. I must do this whilst hanging from a round planet, head outward in space, and with a wind of aether blowing at no one knows how many miles a second through every instice of my body.